Well, the end for this summer, at least. This coming weekend in Tasmania, Victoria, ACT, NSW, and SA sees the end of Daylight Saving Time. Our clocks will go backwards by an hour on Sunday the 7th of April 2019, at 3AM jumping back to 2AM. If you’re awake, you might see 02:00 twice! Luckily most of our systems are pretty smart these days. But some devices need to be checked manually. And some of the systems that involve multiple devices end up a little more complicated. There are some manual steps you should follow if you’re using an Accu-Chek Combo pump with AndroidAPS (to avoid being woken by alarms at 3AM). But everything else is fairly straightforward. There’s also a manual step you need to follow on Sunday if you use the Loop application on an iPhone. Please read on! Most phones these days either get their time from the local phone network, or from internet clocks. They also understand timezones, and can switch for DST automatically if it’s used in your area. So ideally you don’t have to do anything. These devices have no concept of timezone and thus no automatic timeshift. You should remember on Sunday morning to manually adjust the clock (and correct any drift at the same time). Having correct time means your later data downloads will make sense. Most BG meters that link via Bluetooth to a phone app will update their clock automatically from the phone after the next sync. But do note that this means that records of any BG tests made on Sunday before you sync might be off by an hour. Just like BG meters, you’ll need to adjust the clock manually. Especially if you’re later going to compare insulin data from the pump with CGM data collected by your phone. Just do this on Sunday morning. As with the phones and BG meters talking to each other above, these loop systems involve multiple devices which need to be kept in sync, and we need to avoid confusion. As well as BG tests and CGM data, the systems are keeping track of carb and insulin records, and getting these wrong could confuse the algorithms. The details of what we need to do varies between systems. Currently some of them are a lot simpler than others. These systems use the old Medtronic pumps. If you’ve set your timezone appropriately on the rig, the system will update its clock automatically, and OpenAPS will then decide the pump clock is an hour out and proceed to update the pump. Any xDrip+/Spike phone being used to collect CGM data should also automatically change. So ideally you will wake up in the morning and everything will have updated by itself! However it is possible that any subsequent cron jobs you have scheduled (and there are a few standard ones) might not automatically shift for the future. Restarting the cron daemon resolves that, so I recommend that some time on Sunday you reboot your rig just so you know it’s got everything sorted out. Loop runs on an iPhone, which should automatically change time. The Medtronic pump won’t be automatically updated, but Loop will recognise the time difference and will continue functioning properly. In the morning you should not try to change the pump time manually! Instead use the Change Time function in the RileyLink menu, which will both fix the pump clock as well as update Loop’s knowledge of the difference between the pump and phone clocks. This is explained in the Loop Docs. This runs on an Android device, so ideally it would just update by itself and we’d be done. Unfortunately because of the current pump drivers it’s not that simple. The details depend on the pump model you’re using. The phone will update itself at 3AM, and update the pump as required. This should be as easy as it is for OpenAPS. These pumps have some extra features over the DANA R, but this adds a little complication. The pump maintains an internal history of boluses and carb announcements, but this history does not have timezone information attached to it. Thus when the clock is turned back by an hour, AndroidAPS may detect events that have happened in the last hour as being in the future. Even boluses over an hour old may be duplicated and cause AndroidAPS to think you have more insulin on board (IOB) or carbs (COB) than you actually do. 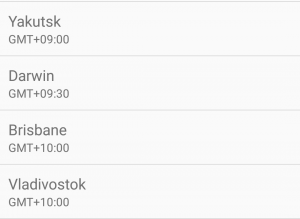 When manually changing timezones for travel you can fix this by “removing” those treatments from AndroidAPS’s Treatments tab (not “deleting” them as AndroidAPS might discover them again from the pump). We can do this here, but it’s unlikely that most people will want to be awake at 3AM to do this manually. So as a workaround, for DST changes AndroidAPS will automatically disable the loop for 3 hours. This means that your pump will revert to its programmed basal rates for that time, but it gives those bogus events a chance to expire and not cause problems. Note this function was added in AndroidAPS 2.2. In the end this means that everything should just automatically change overnight, with the loop being disabled for a few hours (but still with your CGM alarms in place). There’s unfortunately still a flaw in the current Combo driver, where AndroidAPS can’t fix the Combo pump’s clock. Mind you, it will happily complain that the clock is wrong, which is not what you want at 3AM! Like the DANA Rv2 and RS pumps, the pump has a history of bolus treatments which do not have timezone information attached. So for now we have to work around it with a bit of a kludge. We can tell the phone to not change its time automatically in the middle of the night. We instead do it manually when we choose to: either on Saturday or Sunday. The first thing is to turn OFF any setting that automatically sets the timezone, so you can force the time change when you want to. How you can do this will depend on your version of Android. Some have two settings, one for automatic setting of the time (which ideally should remain on) and one for automatic setting of the timezone (which you must turn OFF). 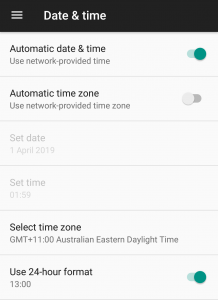 Unfortunately some Android versions have a single switch to enable automatic setting of both the time and the timezone. You’ll have to turn this off for now. Now you’ll need to change your timezone to something that isn’t going to automatically update in the middle of the night. What that timezone is depends on where you live. I’ll outline below the choices for those Australian states and territories that use DST. If you are in Tasmania, Victoria, ACT, or NSW, tell your phone that it is in Noumea. The clock won’t change now, and on Sunday morning when you wake up your clock and pump will both still be one hour “in the future”. 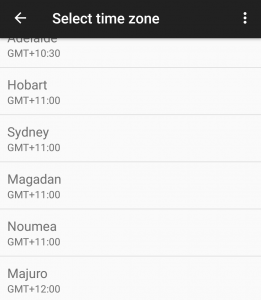 If your phone only allows you to select Australian timezones, see the advice further below about an alternative choice (but keep reading so you understand the process that will be involved). Before you have breakfast, any recent boluses in the pump history will have been small SMB corrections. Your COB and IOB should both be close to zero. 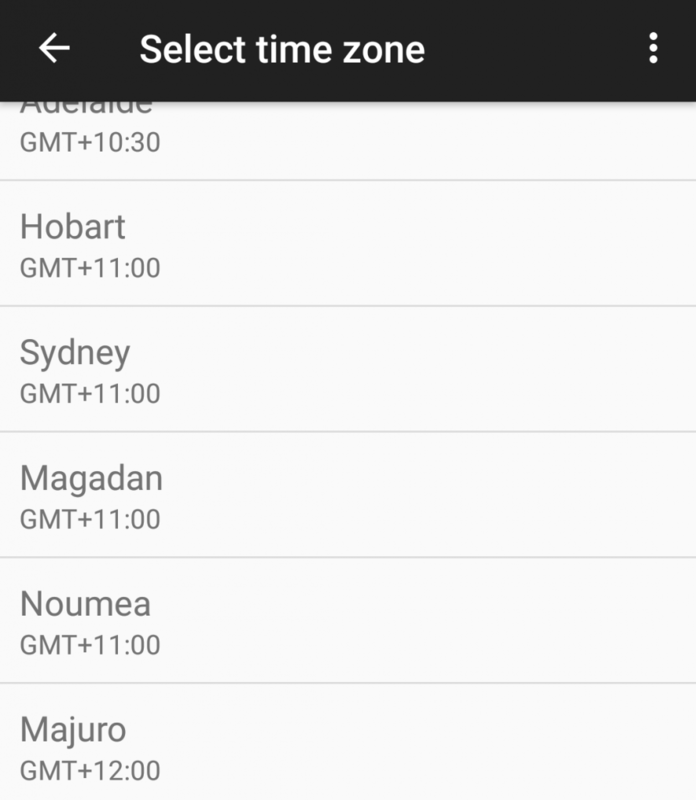 Change the Android timezone back to match your actual location. AndroidAPS will soon start complaining that the Combo’s clock doesn’t match. So update the pump’s clock manually via the pump’s screen and buttons. 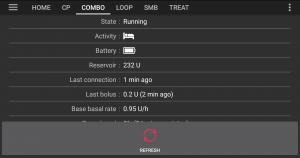 On the AndroidAPS “Combo” screen, press Refresh. Then go to the Treatments screen, and look for any events in the future. There shouldn’t be many. Long-press on each of them and select Remove. Then head for breakfast. You’re done! South Australia – the troublemaker? If you’re in South Australia, there is no convenient fake timezone to delay that shift. No other timezones use GMT+10:30 without DST. So instead of doing the shift on Sunday morning you’ll have to do it on Saturday. Or wake up at 3AM and update the pump clock. If you do the shift on Saturday morning before breakfast, your IOB and COB should be close to zero. If you do the shift later on Saturday you should try to choose a time that IOB and COB are minimal. But if you do the shift on Saturday morning, of course your AndroidAPS device will be an hour behind everything else for Saturday. This will be more of an issue for you if that device is also your regular phone (compared to my own setup where it’s a dedicated device). Set the Android timezone to Darwin. This will turn your clock back by an hour, and you’ll have to update the Combo’s clock almost straight away. After refreshing the Combo tab, head to the Treatments tab and clear up any bogus entries as per the previous scenario. Any time on Sunday just change the timezone back to Adelaide (which should not change the clock) and go on your way. If you’re in Victoria, Tasmania, ACT, or NSW and want to do the shift on Saturday instead of Sunday morning, you can follow the same process as for South Australia. Just set your timezone to Brisbane instead of Darwin, update the pump clock and resolve any future treatments, and then on Sunday set the timezone back to your local zone. The above instructions are localised to Australia, but match the information in the AndroidAPS Wiki. This juggling of timezones for the Combo pump is messy, but work is continually being done to improve the situation. It’s possible that by October when DST begins again that this may happen automagically. For now, hopefully the information in this article will help you make the time transition smoothly and get on with the rest of your life! Not sure if it’s a Pixel3 thing, or an Android version thing. But i’m only given 8 options for time-zones within Australia (I live in TAS). Perth, Eucla, Darwin, Brisbane, Adelaide, Sydney, Lord Howe, and Macquarie. Would any of these achieve the same result, or do I need to select a different country? Rather than selecting Noumea on Saturday and then cleaning things up on Sunday morning, you’ll find another option described further down where you can select Brisbane on Saturday (and immediately fix the pump time) and then revert to Melbourne on Sunday.